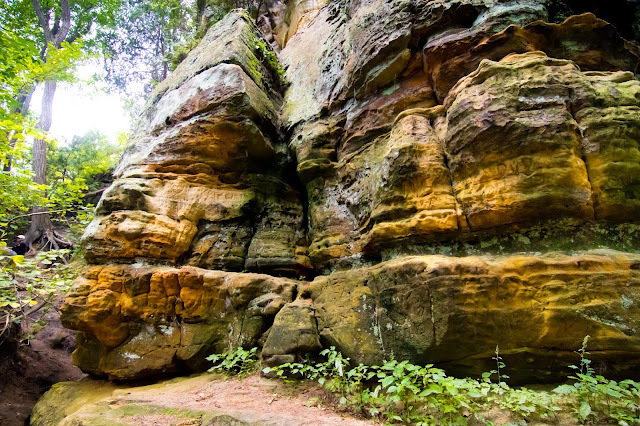 So, finally, we made quick plans to go over to the Starved Rock state park, IL for the long weekend. by the time this plan was getting finalized, it was already past 11 am on Saturday morning. so, the scope was reduced. however by reviews of this location, it felt like all was still not lost. I made quick reservations at the Hampton Inn Suites in Peru, IL for the family. The whole of Saturday went away chilling with the family and little bit of packing to prepare for the trip next day. 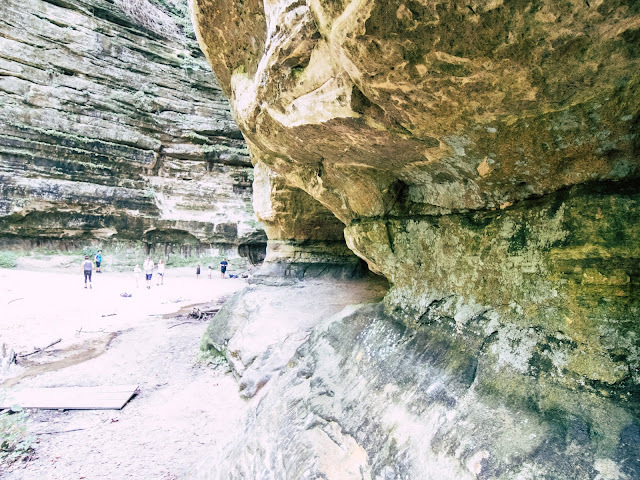 Starved rock is around 70 miles from Naperville, and takes about an hour to reach. 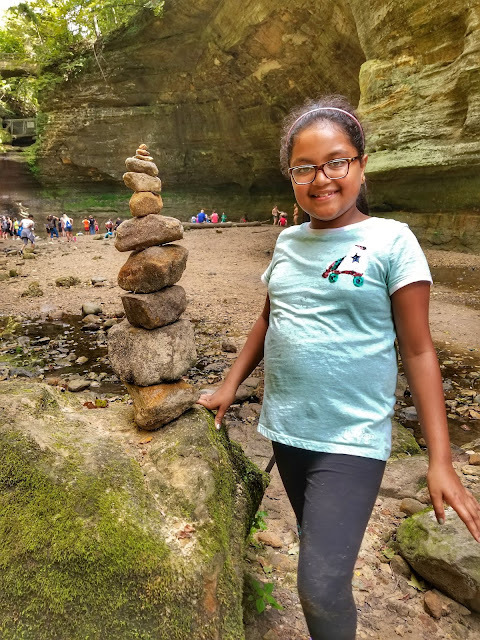 Starved Rock state park to two different entrances of Matthiessen state park- one which leads to all the trails, other is closer to the river basin. There are a few different approaches to get to the destination and it's your call. We took the state highway 71 initial and joined I80 for last 8-10 miles of the journey. Overall it was an excellent experience. a different one. as well as, not so different at the same time. The state park is run very well in terms of how the visitor centre is organized, how the trails are marked and labelled, access to clean water, restrooms, all the creature comforts of a restaurant, excellent ice-creams in searing hot days, clean trails, most of the hikes up to the canyon tops are wooden pathways, and so forth. It makes for a great outdoor activity with the family. By the roadside. An old water gauge and the cornfield early morning. You can see people with all sorts of fitness levels out there. There were big families moving as a group and then a lot of people moving around with their pets. It was good but not very different from a usual trail I would take at Naperville. Why? The trails didn't have stretches which challenge you in terms of the hike, or surface etc. in this sense of the hiking the difficulty levels were 'easy'. As long as you pack lighter, can generally walk and have enough water with you, you can keep going. The views are nice overall. The complete path is pretty clean although, after the initial part of the trail, there are no trash cans on the trail, as well as limited restrooms. 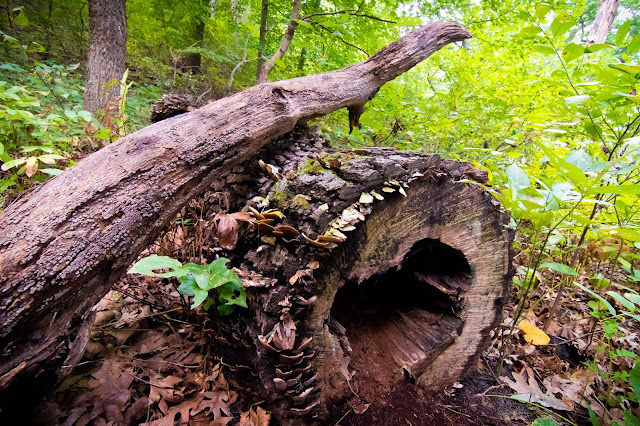 There is also a wide variety of flowers, trees, critters which can be seen on the trail. I didn't see many distinct birds there, but maybe I need to spend more time there to start seeing those things around. 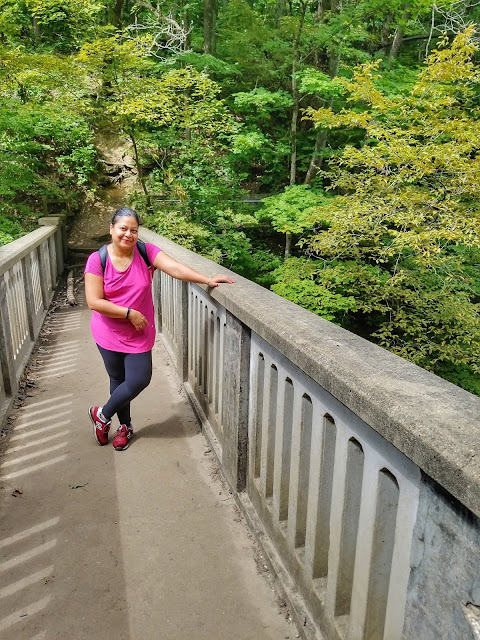 Starved rock park offers a total of 13 miles of trails to explore. 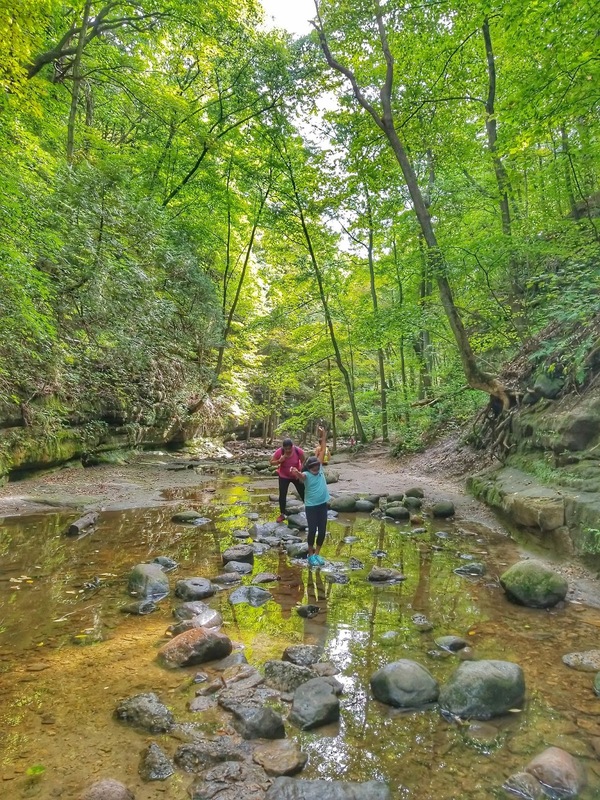 Within these 13 miles, 18 canyons are hidden and the state parks website claims that mostly 14 of these canyons have waterfalls running just after a good rainy season. During our visit, we were told at the visitor centre, only one of the canyon [St Louis canyon] had the waterfall going and other places were dried up. Based on the timing of your trip, this can change. however, I do recommend to re-prioritize your trip based on the canyons where the waterfall is still running. Its a site for sure!!! Passing note: to set the right expectations, these waterfalls are significantly smaller in size and marvel than the ones you may have seen at other 'actual' waterfalls. Within the state park, the visitor centre has a restaurant which offers most of the standard needs. they also have a souvenir shop which was pretty good. however, we didn't buy anything from there. There are multiple vending machines located here as well. The major parking outside offers big parks around the area for people to barbeque and probably during the holiday weekend hordes of people were here for that purpose alone too. if you are looking for serious eating options, nearby towns of Peru and La Salle are your best options. We covered the first day with our packed lunch and ate during a break in the grounds outside of the visitor centre. in the second half, we prioritized our approach and went down to the St. Louis Canyon. 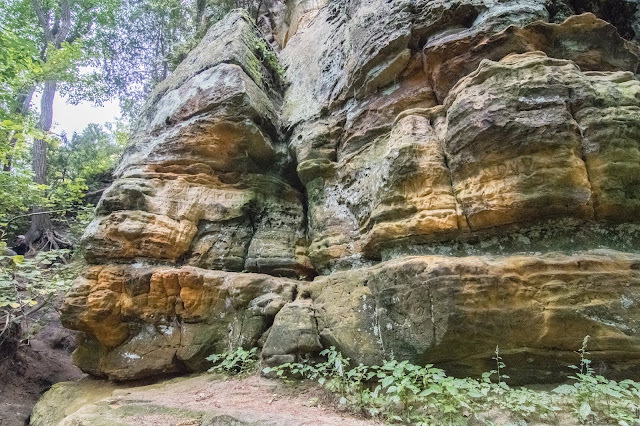 This canyon is just right around the corner from the main entrance to the starved rock. You need to come out to the main road, and drive about 1 mile. fairly easy to spot. St Louis canyon was similar to the other canyons we covered [french canyon, etc] but the view was nicer, and it felt like a bigger canyon overall. 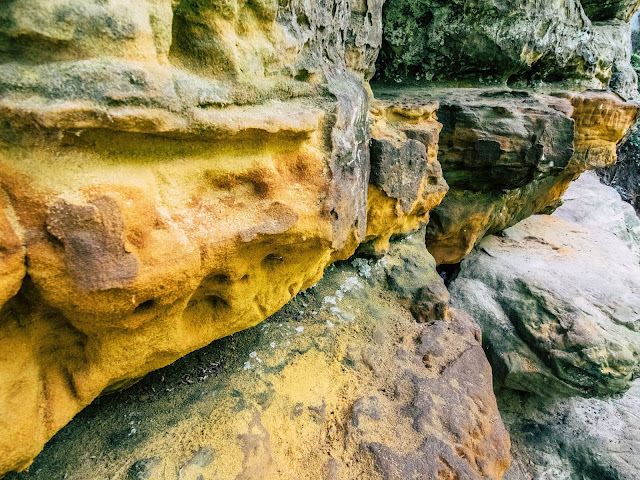 it had the waterfall going for it, and just the formations and colours of these sandstone rocks were amazing. Park's website says that it is open until 4 pm, however, we, noticed that its pretty much open and you will not get into trouble unless it's already dark. as long as the weather is good, the light is good, I didn't feel you would see much issues. We reached the parking of St Louis canyon around 3:45 pm. Then walked 40 mins to the canyon. Spent an hour at the canyon. Came back around 6 pm. Quite a few people were around there at that hour as well. 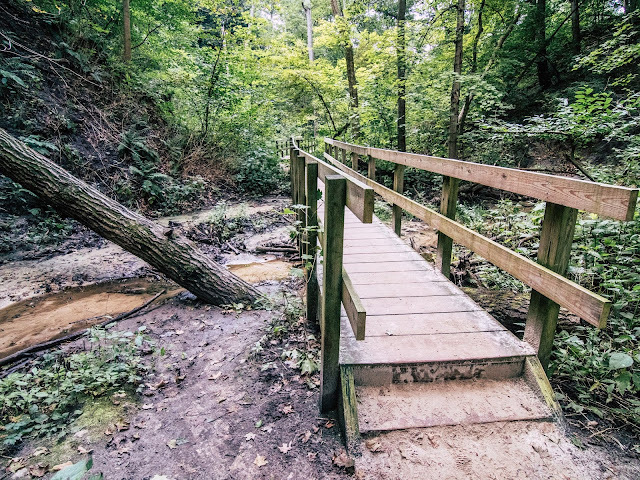 Next morning we were planning to return back to the starved rock park, but my instinct took the turn for the better. reading about the Matthiesen park, I figured its better to spend some time there before heading back. We discussed the plan, agreed and after a good breakfast, strong tea, and packed bags we left for the Matthiesen state park. and boy, was this decision right on target! 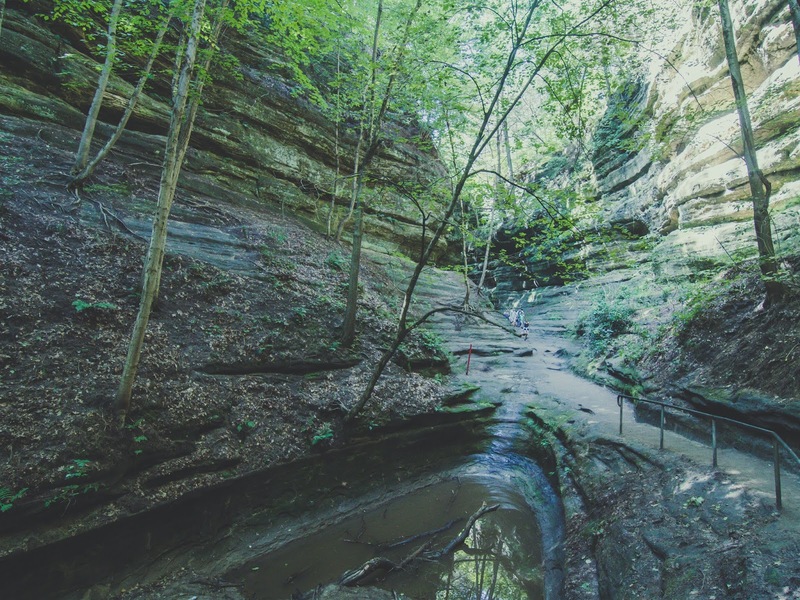 unlike the Starved rock park, Matthiessen park is quite different. It's not as popular, which means not too many people show up and throng. There is no fancy visitor centre! And there is an entrance[on the river side] which I suggest you avoid if you are not interested to go to the river and rather are interested in the trails and sandstone rock formations. Refer to the map. We got to the parking after trying to find our way, around 10 am. and there were just 10 cars at the location. It was pretty chilled out. We began walking which is when I realized that portions of this trail are kept well, and have wooden stairways. however beyond a certain point, as you begin going through the lower dells and upper dells, a lot of the way is unpaved, uncharted, mostly rocky and watery. You have to find a way for yourself in most cases. and that's the cool part of all. This park has much better views. most of the waterfalls were nicer. the hikes were little more challenging and felt much more natural. Views were significantly much more beautiful than the starved rock page. 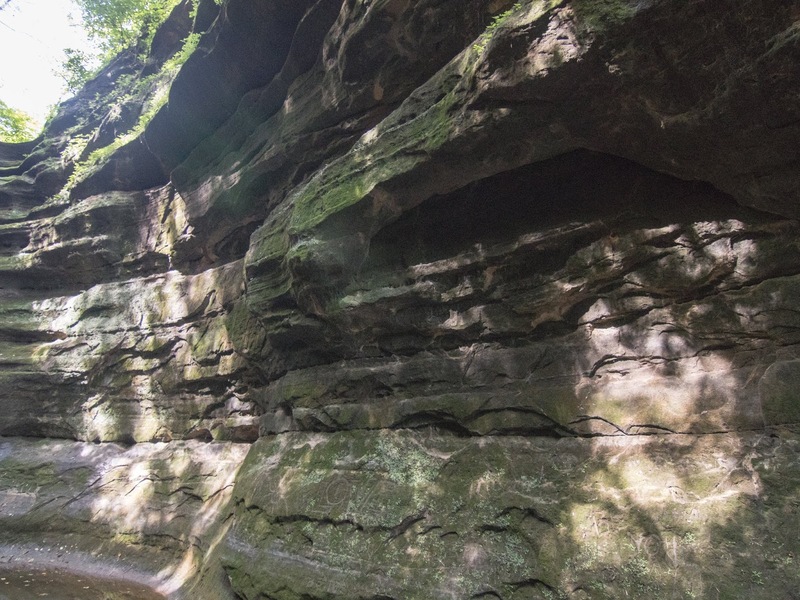 If I plan to revisit this place in fall, I would probably start with the Matthiessen park first this time and spend more time there. The first question to ask yourself is do you need to stay overnight? 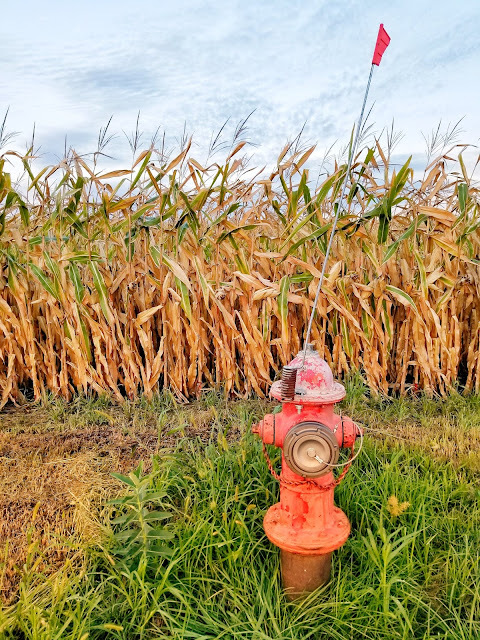 Due to the close proximity to Chicago, I realized that we could have easily done a day trip and return the next day if we needed to. We just preferred staying over the night. If that is the case with you as well, there are a couple of options. You could stay at the lodge inside the state park. This looked like a good option. secondly, there are a lot of camping group options here, for those who would like to camp at the location. find information on camping here. And if you are like us and looking for hotels around, then Peru, IL is the nearest location to find all the usual hotel chains to stay. Peru also has all the major restaurant chains for food, and everything else and it's around 7 miles from starved rock state park. Dress appropriately. the feeling of hot or cold significantly changes when we walk with a bag for a long time, hence dressing appropriately to the weather is the key. light clothing which lets your body breath is important. Carry water. Can not be emphasised enough. water is the #1 resource during the hike. Carry what you need. no reason overloading bag with hundreds of things which you don't need. plan well. take only what you will need. 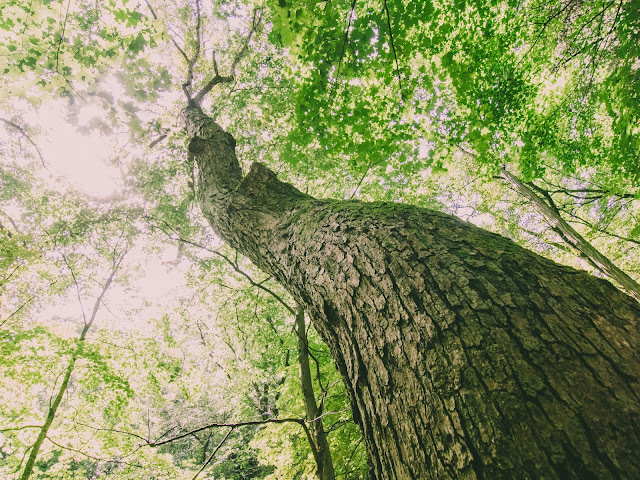 plan your hikes based on your plan for the day. before you begin, figure out if you want to get back for lunch to the visitor centre. choose your trails accordingly. You can also break down your trip based on different parking spots around the park which may be closer to the trail you are looking for. Pls, do not litter. carry your trash. pls, do not put unnecessary graffiti on the rocks. they look much more awesome without your name on them or tell us when you visited or who you loved at that time. So, what do you think? Have you been to this park before? how was your experience? or does this blog make you want to visit these parks? Do write in your comments and let me know. While i take time to write, i love to read what readers think about it. Did the content help you? Do Leave a comment on what you think about this article? 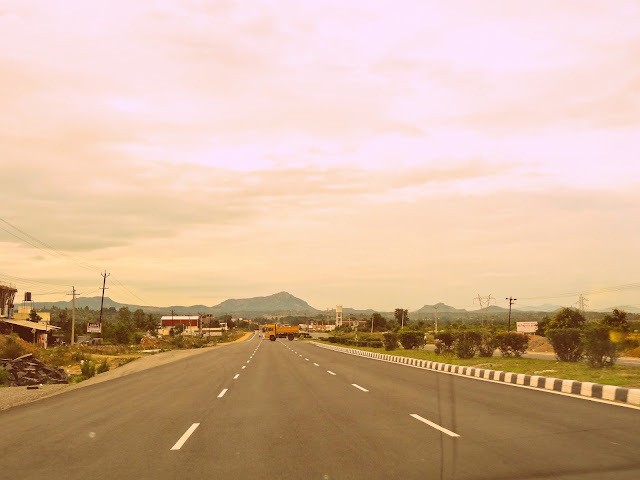 Temples of south india: Bangalore-Vellore- kanchipuram- tirupati- Bangalore. Part 1.